For those of you not conversant in Latin that translates to “Repetition is the mother of all learning”… a little cultural diversity offered to visitors who are no doubt tiring of the reading same points merely phrased differently in English. The more that kept up we might’ve been faced with another Latin saying being used by those frequenting the site, namely – Tace! Supprime tuum stultiloquium! (Alright, alright, so you don’t leave the site to find the meaning somewhere else it means “Shut up! Stop your blathering”). But back to the ORIGINAL saying about repetition being the mother of all learning… aside from sounding phonetically better saying it in Latin, it also applies nicely when studying something as vast as rock history. The giant turning points of any epic journey are always the ones referred to by historians because they SEEM like the key to the story, but that runs the risk of becoming the whole story in their condensed versions of that history. By inordinately focusing on just those big moments there’s hardly any chance for context to be established, for getting a sense of what the entire style was about at any given time which is truly where the action is found. The context we’re referring to is the dominant sound of 1948 rock ‘n’ roll: the sax-led instrumental. By October, thirteen months into rock’s lifespan, the number of legitimate rock hits is still relatively small, but growing. The types of rock to reach the charts covers all of its many stylistic avenues, the gospel-infused ravers, soulful laments, boastful crowing, lecherous sounding harmonies and more innocent, naïve and hopeful harmonies as well. But what we’ve seen the most, what’s come to define the excitement of rock ‘n’ roll this past year is the sound of saxophones moaning, grooving and honking up a storm. Of the nineteen rock songs to make the Billboard charts by October 1948, ten of them, not to mention 3 of the 5 to actually hit #1, have been sax-led instrumentals with more soon to follow that had already been released but were still climbing their way into the best seller lists. When you take into account the regional charts those numbers rise even more. This trend will continue well into the next year as well making the late 1940’s rock scene the most concentrated dose of instrumental mania rock has ever seen. So it becomes vital to show just how widespread it was to properly convey the atmosphere of that time. So yes, the sound itself – particularly because these records are devoid of vocalists singing specific lyrics to imprint themselves on your brain – may be repetitive, but it’s repetitive precisely BECAUSE it was so popular. But repetition in this case doesn’t mean unoriginal or unambitious. Though the intent as always might’ve been simply to court sales in the hottest realm of the idiom, the means with which many of these musicians tackled that goal was unique. For many of them, long resigned to being in the background of larger ensembles with little of the spotlight shining on them and thus receiving little public credit for their contributions, the opportunities afforded them in rock ‘n’ roll where they had the chance to become a star were liberating. While the gaudy style might not have always been their preferred approach – see Hal Singer’s Cornbread, currently sitting a top the Billboard charts for example – it was the surest way to making a name for yourself. And if you didn’t want to make a name for yourself nationally, well, why didn’t you become a postman or a dentist instead of a musician? Frank Culley – so far as we know – never pulled teeth and up to this point in time anyway hadn’t even received any fan mail. The latter was about to change. Culley was another guy who needed rock ‘n’ roll to come along to give him a purpose in life. Already thirty years old and a professional musician for about a decade, he had little to show for it. He’d only just begun to lead his own band after years of club work but had made no recordings yet, not under his own name or even prominently backing others. Then rock ‘n’ roll is born and while he wasn’t quite quick enough – or more likely wasn’t in a position enabling him – to capitalize on the sound before the recording ban hit, once the style exploded throughout 1948 with the saxophone leading the charge Culley’s eyes lit up. This was his chance at the big time. Not only was rock placing his chosen instrument at the forefront of the music, whether as a featured performer or sideman, but even more crucially they were emphasizing the very aspects of his already established performing style which were decidedly out of place in almost every other type of music that existed outside of a burlesque theater band. Despite what ill-informed modern biographies claim, saying his nickname was bestowed upon him as the result of a 1949 instrumental cut for Atlantic, Culley was actually already widely known as “Floorshow” before he recorded a single note for anybody, let alone Atlantic whom he wouldn’t join until January ’49. 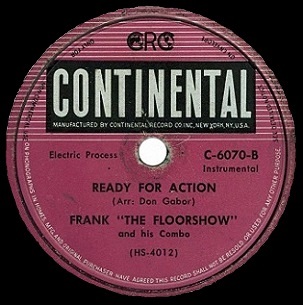 As you can plainly see at the top of the page on the record label the original Continental Records release of this record doesn’t even use his last name at all, just crediting him as Frank “The Floorshow” (though when picked up by Lenox for wider distribution they changed it to Frank Culley). A notice in Billboard magazine from November 1948 announces a six week gig he was embarking on using the Frank (The Floorshow) Culley moniker already as well. So any idea that the record on Atlantic which used his nickname as its title, which wouldn’t be recorded for another couple of months and wasn’t released until the next summer, was the source of that name is yet another example of writers and historians jumping to ill-informed conclusions without bothering to do any research on their subjects to verify something. But enough about them… The reason Culley had gotten that Floorshow nickname in the first place was because of the way he played in clubs – a highly visual style wherein his trademark was leaving the club while still blowing and heading off somewhere else before making a grand re-entrance, and so if anyone was made for rock’s flamboyant brand of showmanship it was surely Frank Culley. Which is why this is not quite what we’re hoping for even though it fits the bill in the most basic of terms. 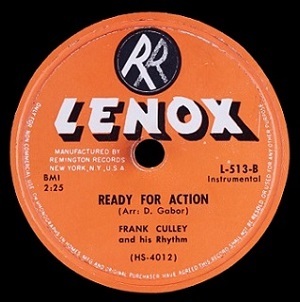 Ready For Action was an entirely appropriate title for Culley’s debut, hinting at the excitement to follow on record that he was already known for as a live performer. The problem is the title winds up being something a tease for much of the time, focusing more on the “ready” half of the equation – the anticipatory stage – rather than the “action” quotient, IE. the payoff. It starts interestingly enough with a fluttering tone like bees buzzing in your ear as the cymbals sound a warning that you may soon get stung. But rather than present a swarming attack from there, twelve seconds in we see we have nothing to fear because they’re keeping a Plexiglas barrier between the bees and us, removing the threat and thus removing the stimulant that accompanies more daring displays. It’s hard to conceive of what might be his thinking behind this safer approach. Surely the very reason he was signed to a contract was to take advantage of the recent surge in popularity of the mayhem the tenor sax revolution was igniting. While it’s true that not ALL of the biggest records in the rock instrumental field were confined to the most vulgar honking imaginable, the other successful form – that of the more sultry lurid groove – wasn’t present in Ready For Action either. It’s almost as if having finally been given the chance he’d long dreamed of Culley held back some, not wanting to be criticized for tastelessness if he went too far off the reservation. Yet the types of people who were prone to criticizing the more garish displays weren’t the ones buying the records, nor depositing their money in jukeboxes or coming out to the shows to lose their inhibitions if not their minds by dancing to this noise. It could also be that Culley, having no experience in crafting songs for records, wasn’t quite sure how to do so and felt he had to build up to the big display he has waiting (sorry to ruin the suspense). Normally that would be a smart idea, but as stated the intro here, which does work quite well, renders that approach moot. The first twelve seconds BECOME the build up because of how it’s crafted. To then ease off in preparation for a second build-up and subsequent explosion takes away too much of our focus so when he finally DOES start to cut loose as we near the one minute mark we don’t really trust it. Sure enough he alternates from there on in with jazzier passages sharing time with the squealing highs and intermittent honks. The drummer is bashing out a solid beat behind him trying to rouse your interest and by this point you ARE getting into it all and enjoying it, but the fact remains the highs never get high enough and the lows are a bit too low for any of it to really connect. Nothing off-putting by any means, even the weaker aspects aren’t weak in their playing, just their purpose, but the best moments fall short of the best the entire style had achieved to date and so it can’t pull Ready For Action up any further than merely serviceable, middle of the pack, rock ‘n’ roll. Still, the very fact this exists as an average rock release for the fall of 1948 is a good sign for the long term prospects of the genre itself. These are starting to be made with a definite commercial purpose in mind, with companies offering up more and more records which allow sax players to have full reign to do as they please in the hopes that the results will be exciting enough, interesting enough, or shocking enough to draw listeners. That this one specifically didn’t seem to do so matters less than usual here, because in this case it was more about reinforcing the sound that was spreading like a sexually transmitted disease in a whorehouse. Pretty soon everybody who entered rock ‘n’ roll would be infected, and sure enough we’ll see that around the bend with Culley, who found himself recruited to play behind a bunch of major rock stars, most notably Wynonie Harris right around the corner. From there it wouldn’t be long before another – not yet bigger, but much more ambitious – label beckoned and Culley would start to hit on all cylinders. Unlike some other early sax stars whose pre-rock output we’re able to examine and thus can start to see what they shed in order to fit into this new form of organized bedlam, with Culley we can only guess. But the circumstantial evidence – from his nickname to his reputation that gave him that name to the brand of music he took on from the start, even if that start was slightly underwhelming – shows that Frank Culley was somebody whose mere existence as a recording artist was due entirely to rock ‘n’ roll. That’s the context that’s important – this mutant style was now launching careers rather than simply corrupting existing careers. Leave a reply on "Frank Culley: “Ready For Action”"